Apple Cider Wood Sign, by Our Backyard Studio in Mill Creek, WA. 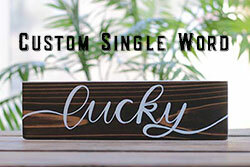 This little sign is perfect for a small wall space, office area, ornament, or hanging from the center of a wreath! Hand painted on reclaimed wood, this Apples sign makes a great wall accent for your country apple kitchen, a fall look, or primitive home decor! 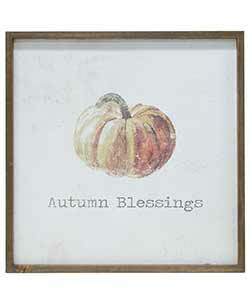 Sign displays a watercolor pumpkin image, and reads: "Autumn Blessings." Measures 20 x 20 inches. 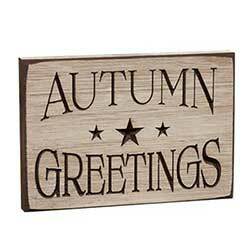 This decorative wooden sign features a festive ivory color and engraved stars, lettering reads: "Autumn greetings." 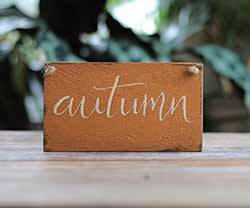 Painted on an old scrap piece of reclaimed fence board, this rustic wood sign features free-hand lettering in cream against a pumpkin orange background. 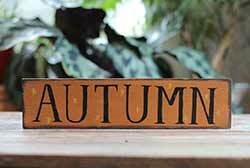 Painted on a scrap piece of old, reclaimed fence board, this rustic wood sign features free-hand lettering in black against a pumpkin orange background, with small stars in mustard yellow. 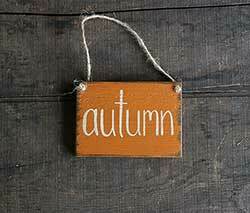 Reads: "Autumn." 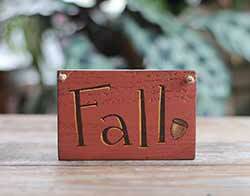 Hand painted on reclaimed wood, this Autumn sign makes a great wall accent for your country fall decor! 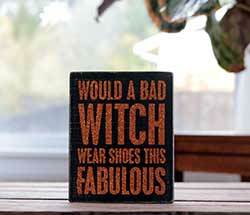 Reads: Would a bad witch wear shoes this fabulous! Measures 4 x 5 x 1.75 inches. Beauty & the Beast Box Sign, by Primitives by Kathy. 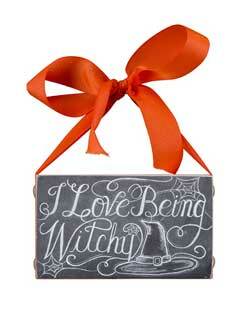 Painted and aged in black with orange glitter lettering, this hangs on the wall or sits on a shelf. 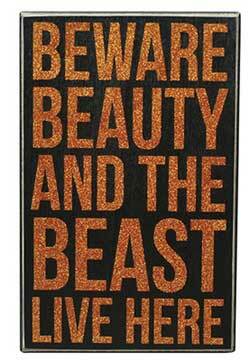 Reads: Beware, beauty & the beast live here. Measures 7 x 11 x 1.75 inches. Made of wood, intentionally distressed and aged for a rustic look. Deep wood box sign with decoupaged paper front printed with chalk-style lettering and a chalk-board look. 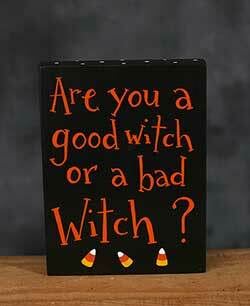 Decorate your door or wall space with this vintage style halloween sign! 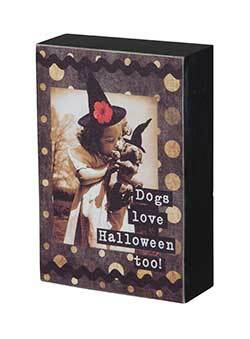 Features black glitter lettering, image and trim. Our mini stick shelf sitters are great for adding a little charm to just about any room in your house - This one is distressed for a spooky old look, and reads "Happy Halloween." 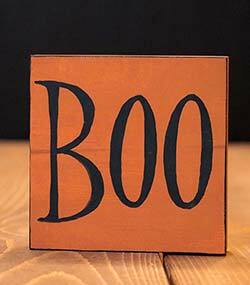 Boo Shelf Sitter / Sign, by Our Backyard Studio in Mill Creek, WA. 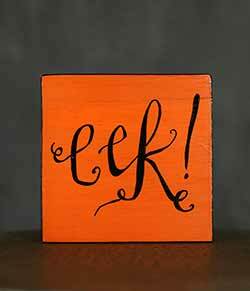 Painted on an old scrap piece of pine, this small sign features free-hand lettering in black against a pumpkin orange background - sign has been sanded lightly for a rustic look. 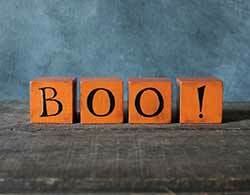 Reads, simply: "BOO." 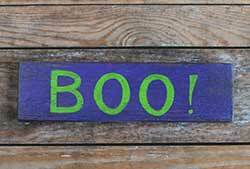 Add a rustic look to your Halloween decor with this hand painted "Boo" sign! 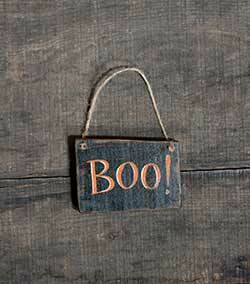 Great for your country, primitive, or rustic style halloween or fall decorating. Bountiful Sign, by Primitives by Kathy. 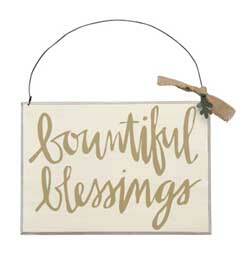 This wooden plaque is painted a cream color, with pretty lettering in a taupe color reading: Bountiful Blessings. Measures 10 x 7 inches. Made of wood, wire, leaf charm, and a fabric tie. Purposefully aged and antiqued for a rustic primitive look. 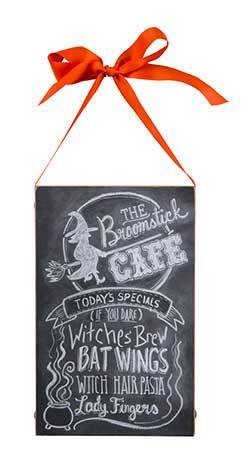 Broomstick Cafe Chalk Sign , by Primitives by Kathy. Deep wood box sign with decoupaged paper front printed with chalk-style lettering and a chalk-board look. Orange ribbon attached all the way around, creating a bow on top for hanging. This one reads: the Broomstick Cafe, Today's specials (if you dare): Witches Brew, BAT WINGS, WITCH HAIR PASTA, Lady Fingers. Measures 7 x 11 x 1.75 inches. Wood, paper, and ribbon. 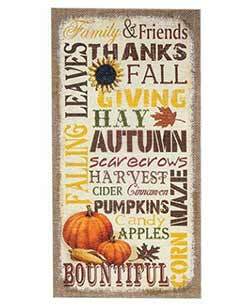 Add color and rustic style to your wall this autumn with this burlap wall hanging, featuring an assortment of fall words, colors, and fonts. 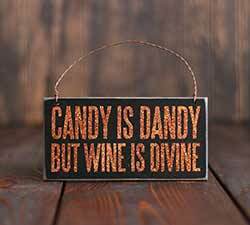 Make a great halloween party favor or hostess gift! Painted black, distressed, with orange glitter lettering. 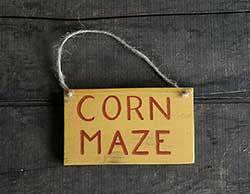 Hand painted on reclaimed wood, this Corn Maze sign makes a great wall accent for your country fall decor! 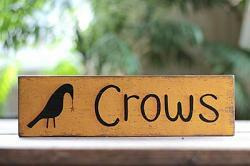 Painted on a scrap piece of old, reclaimed fence board, this rustic "Crows" wood sign features free-hand lettering in black against a golden, sunflower yellow background, with a painted crow and star. Candy Oh My Sitter, by Primitives by Kathy. Features artwork by Kari Emerson. Reads: Dogs love Halloween soon! Hangs or sits. Measures 4 x 6 inches. Made of wood and paper. 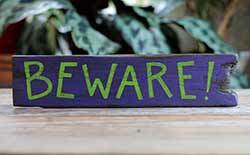 Eek Sign / Shelf Sitter, by Our Backyard Studio in Mill Creek, WA. 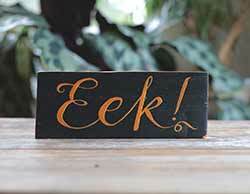 Add that perfect, simple touch of Halloween to your mantel, shelf, or work desk with this pretty typography eek sign! 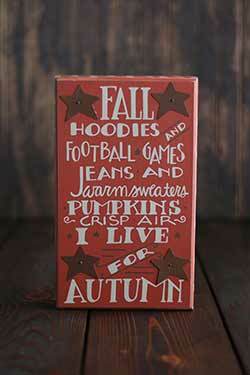 Deep wood plaque painted orange, with white lettering: Fall hoodies and football games, jeans and warm sweaters, pumpkins, crisp air, I live for autumn. 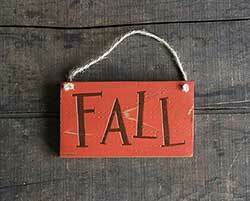 Hand painted on reclaimed wood, this Fall sign makes a great wall accent for your country fall decor! Deep wood plaque painted off white, with black lettering: Free leaves - Rake all you want. Hangs or sits. 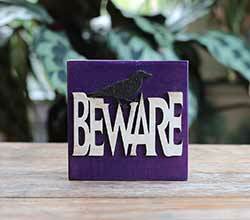 This deep wood sign is filled with Halloween words and creepy fonts! This is for the ORANGE sign. 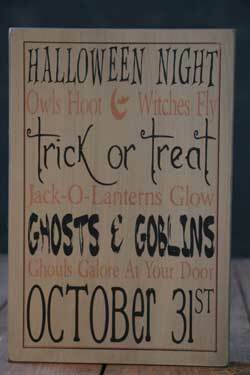 Ghosts & Goblins Box Sign, by The Hearthside Collection. 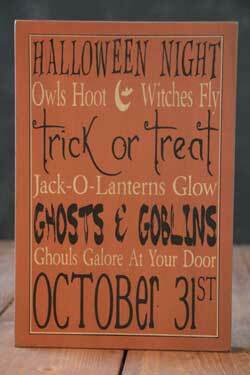 This deep wood sign is filled with Halloween words and creepy fonts! 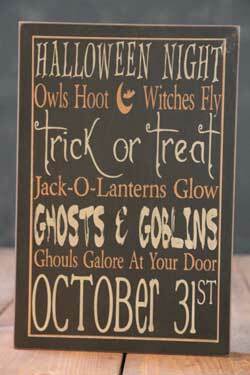 This deep wood sign is filled with Halloween words and creepy fonts! This is for the BLACK sign.